For many food might not be something you want to talk about right now. I know many of us might have had many large and delicious meals over the Holidays. I know many that are thinking of cutting back on their food intake since they might have had more over the Holidays than they normally would have had. Well, no matter what your present relationship is with food, I am confident that you will be eating. So what is it you are eating? I am looking to get some ideas here. I am not asking for any particular TYPE of recipe, as in, I don’t need it to be gluten free, dairy free, meat free, or fat free. I am just wondering what you are eating. Not everyone that reads this blog is looking for any of that so ANY recipe you want to share would be welcome. What can happen is that people can make adjustments as necessary. Just give us your ideas and/or recipes as to what to eat! It can be breakfast, lunch, dinner, or even a snack recipe. I am often looking for dinner recipes. You know my normal fare; roasted veggie, ground turkey, something in a tortilla (although I have been avoiding the flours ones because of the transfat/partially hydrogenated oils). My friend just pointed me to a Martha Stewart recipe that I am sure you will be hearing about soon. I am kind of interested in Polenta. What about you? Do you have any Polenta recipes? I have been making a lot of Sausage, Beans, and Rice. It is so flavorful and so easy, when I don’t have time to think of something else, I make that. I am still enjoying my organic box of produce. I love when we get fennel. I love that Fennel Turkey Recipe I came up with. I just made it the other day. We haven’t really gotten anything new in the box lately, except cranberries and I have not idea what to do with them same as last year when I receive them. What do you do with fresh cranberries? My sister in-law put some in the stuffing over Christmas. What about you? Maybe you had a yummy dish over the Holidays you want to share. That would be great too! Just tell me what you are making and eating. Give me some ideas. You know most of mine ideas. You know I have a stove, an oven, and a crock pot. I am not versed in how to use the grill, but I might venture out to do so, if I can get at it before my hubby gets home. He claims that as his — well, it is. Ok so this is a call out for ideas and recipes. Any and all is fine, I reserve the right to pick and choose because somethings I don’t eat, but you can still post the recipe because there are other who eat things I don’t eat. C’mon, help me out. What have you got? I read a blog written by a man in France. He writes his posts in French and English. He owns and runs a Bed and Breakfast in France. He takes fabulous pictures and posts a lot of yummy and interesting recipes. One recipe he posted I couldn’t wait to try, but I had to. When I read the post it was the week of Thanksgiving and I was going out of town so I couldn’t make the recipe. When I got back I had forgotten about it, but he replied to my comment which notifies me so I was reminded. I went to the store the next day to get the ingredients. There are only two or three in his recipe (I added a couple more)! It is so easy. It is one of those dishes that tastes rich and fancy but it super simple. The link to his post is here. Do go to his blog and check it out. As I was making this I realized his recipes are like mine or mine are like his — a guide. Here is how I made his mushroom soup recipe. I only bought two pounds of mushrooms because 1) I thought that would be enough for my husband and I and 2) Mushrooms are $4.49 a pound and I didn’t want to spend $20.00 on mushrooms. 🙂 I also only purchased two shallots. I thought I had one in my refrigerator but I didn’t so I only ended up using two. Which was fine. I also didn’t use any cream. With his recipe he put a drizzle of cream on top or instructed how to blend it in. I didn’t bother with the cream. I am so glad I didn’t because the mushrooms and shallots are rich enough. It was so yummy. I am going to make it again this week. I wash my mushrooms. I know many chefs say to just dust them off, but . . . . I prefer to wash mine. Heat a tablespoon of butter. 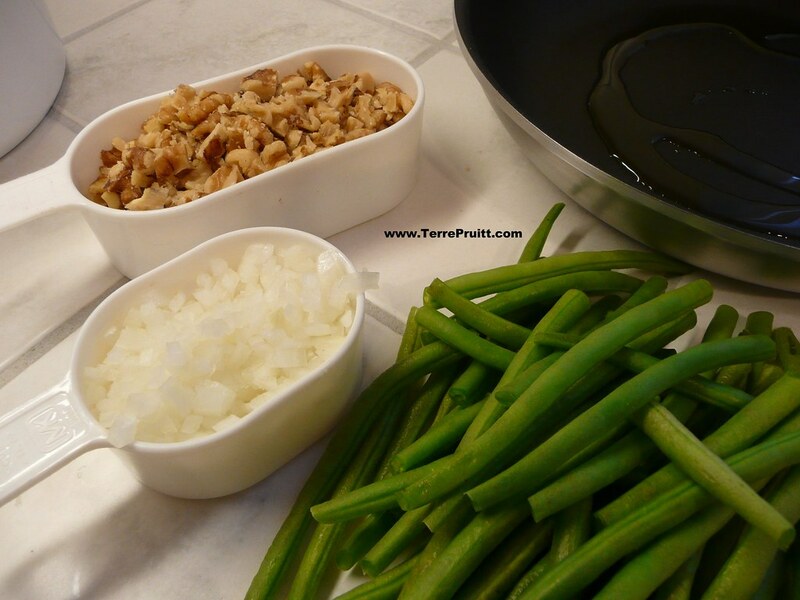 Once melted add the chopped shallots and a tablespoon of butter. Cook the shallots, when they start to become translucent add the mushroom and the remaining tablespoon of butter. Cook/brown the mushrooms. Add salt and pepper to taste. 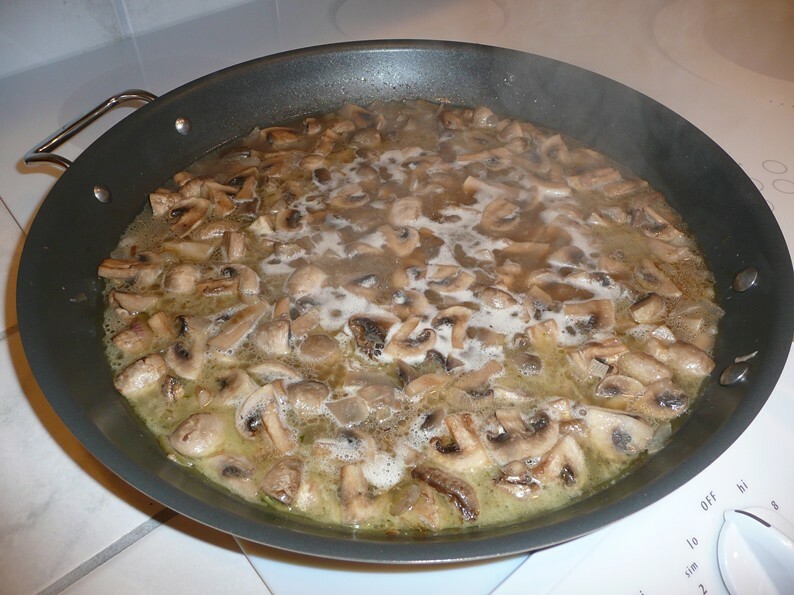 Add enough white wine and water in combination (whatever combination YOU desire) to cover the mushrooms. Bring to a boil. Lower the temperature to a simmer. Simmer for 30 – 40 minutes. Blend in a blender or with a stick blender. Once blended, spoon/pour into bowls. Top each bowl with chopped onions and Parmesan cheese. Be certain that you blend the soup according to your blenders specifications — most instructions on blenders say to cool before blending. I barely let mine cool because I wanted hot soup. I have a Blendtec which heats the soup up while it blends. So, blend and heat as is necessary according to your blender. 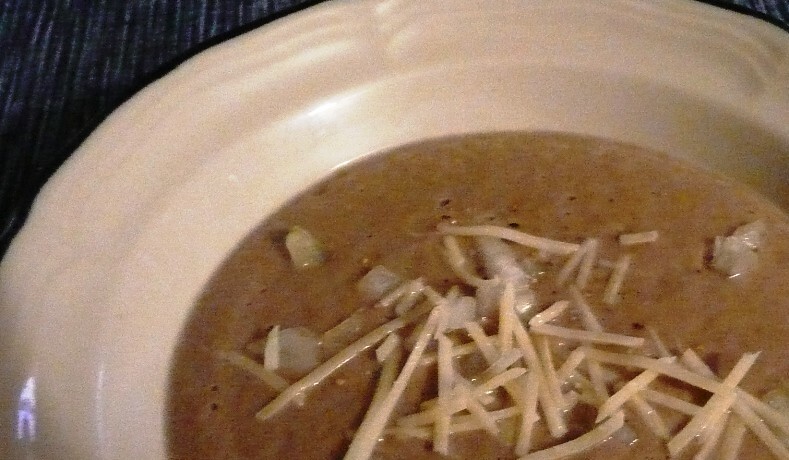 Stéphane’s recipe recommends garnishing the soup with mushrooms. I know that presentation is a big part of serving dinner and he is really good at that. For me, I am just happy to get a meal on the table and I rarely think of presentation. You may be better at that than me so please — have at it. I am convinced that the presentation — no matter what it is will be long forgotten once they taste this soup. It is so yummy, they won’t care how it is served! 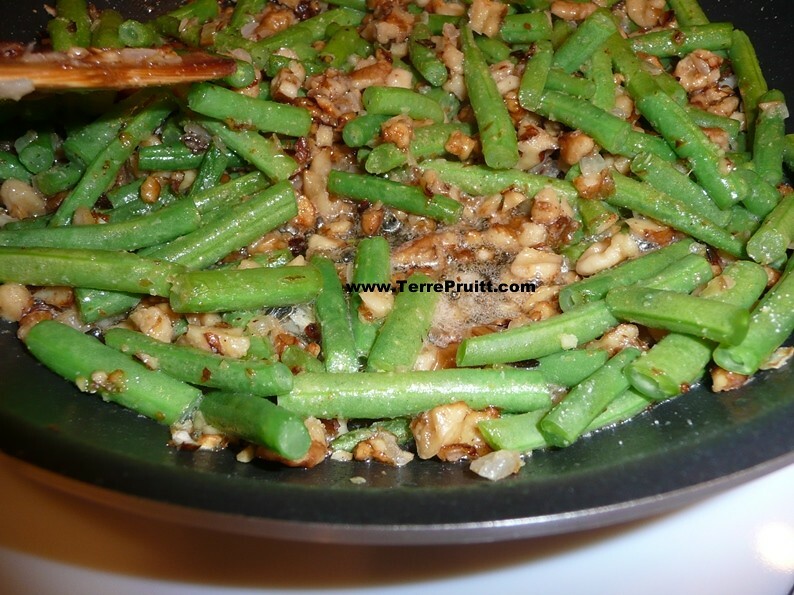 I am grateful to Stephane for posting such a simple recipe that is so yummy! My husband really loved this so we will be eating it often. Do you like mushrooms? Can you believe how simple this soup is? What are you going to add to this recipe to make it perfect for you? 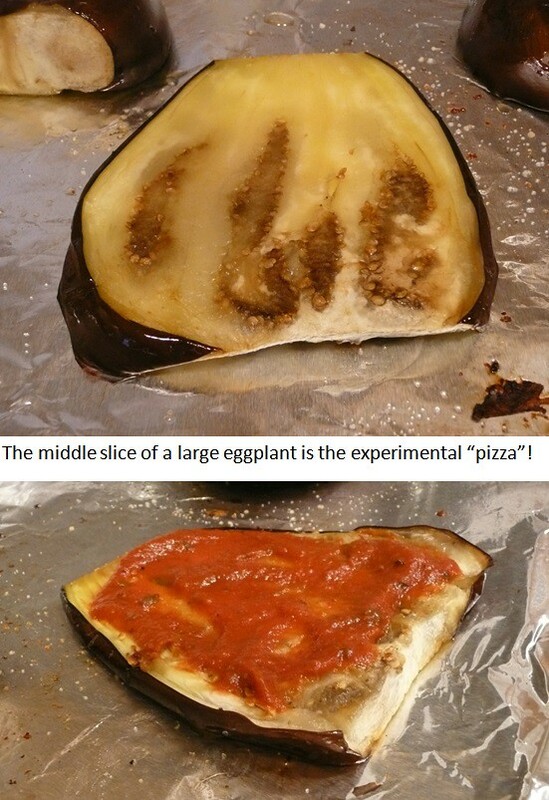 I have always wanted to make “pizza” using eggplant. But I usually don’t have tomato sauce. 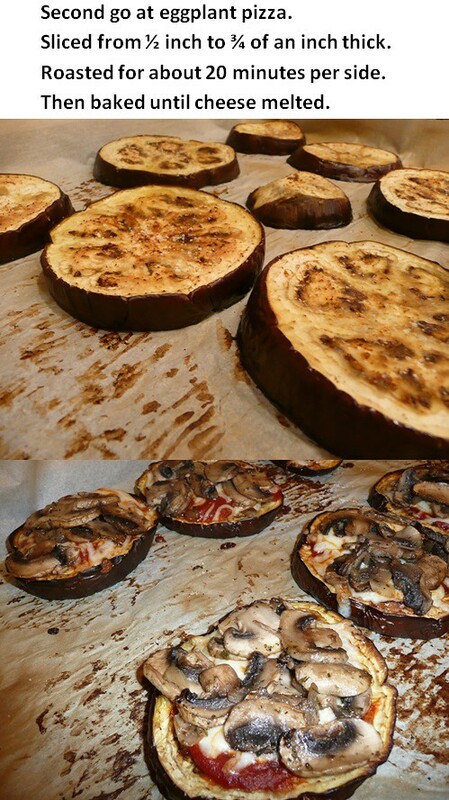 The eggplant “pizza” I have always wanted to make is using a slice of eggplant as the “crust”. Not putting eggplant ON the pizza, nor making the crust with flour and eggplant. Just a slice of eggplant as the “crust”. You might be familiar with me not really liking tomatoes. That lends to me not really liking tomato sauce. When we have pasta we don’t normally have tomato sauce. Although lately I have been buying some. Yes, the jarred kinds. I know it is silly to buy the jar kind when it is so easy to make, but since I don’t really like it, it is one of those things that I don’t bother making. If I can buy an organic jar of tomato sauce for a quick dinner every once in a while I do. Well, the last time I used it I made the My First Tomato Sauce Lasagna. I didn’t use the whole jar. Recently I bought an eggplant and it was HUGE. Normally I slice them in half and roast them, but this one was huge, but I was really looking forward to the roasted kind, so I didn’t want to make pizza out of it all. So I sliced it in thirds lengthwise. Planning to use the middle slice for the pizza crust. I finally had eggplant pizza! I roasted it first. Then I piled on my toppings. I realized I needed to roast it longer. The eggplant got VERY soggy after all of the toppings were on it. If you REALLY like eggplant it is no big deal. I am not sure if the eggplant pizza would ever be a pick-up-and-eat-it-like-regular-pizza type of pizza, but it was really good. Sprinkle oil on the eggplant and roast at 400° F for about 20 minutes . . . depends on the size of your eggplant and how thick you cut it. After 20 minutes flip it over sprinkle with oil and salt. Cook for another 15 or 20 minutes. Check it and decide how cooked you want it. Then top with your favorite pizza/tomato sauce and your favorite pizza toppings. Bake it until your cheese is melted. Mine had tomato sauce, mozzarella cheese, and sautéed mushrooms. It was sooooo good. Mushrooms are my favorite pizza topping. When I make pizza, it is usually just with mushrooms. I prefer to cook the mushrooms first — no matter what crust I am using — to get out most of the moisture and ensure that they are cooked when I eat my pizza. Anyway . . . this was very good. So good I made it again but this time I sliced the eggplant in rounds. I used the same toppings. This second time the eggplant was a little less soggy, but it was still not something you could pick up like a regular piece of pizza. I roasted the slices for about 20 minutes on each side. 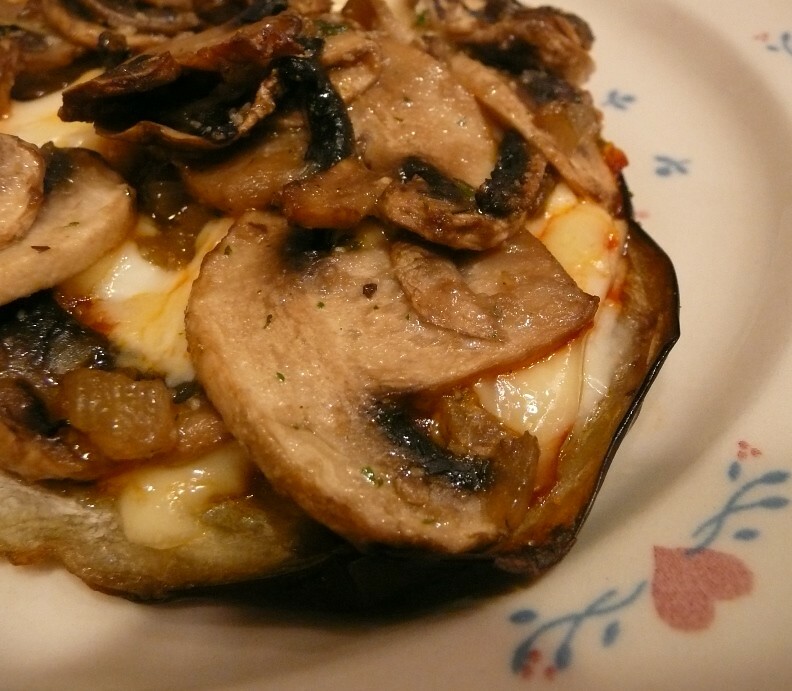 The eggplant adds a nice flavor to the pizza toppings I used (tomato sauce, cheese, and mushrooms). And as long as your sauce and your toppings are gluten free this is a great pizza to have for those who are avoiding it! What about you? Have you ever wanted to try eggplant as your pizza crust? Have you ever tried eggplant as your pizza crust? I first saw this recipe via a post on Facebook. A Nia friend had shared it from a group on Facebook. Neither my friend nor the person on the group had made them. I was not planning on posting about them. I know I say that all the time, but this recipe looked so quick and easy I didn’t really think there would be much to say about it. But I found that I needed to make some adjustments to the recipe in order for it to work for me. The directions in the post just baffled me because they instructed to cook the “pancake” for 20 to 30 seconds. As mine were cooking and I was standing there diligently waiting to flip then, I wondered what type of stove the person had. I wondered what type of pan. I wondered if they liked raw eggs. The food in my pan was no where near cooked much less in a state that could be flipped at 20 to 30 seconds. Because I often think I will not post about something, but then I end up wanting to, I did actually take pictures from the beginning. But then near the end of the cooking process I was more convinced I would NOT post so I didn’t get any good shots. But as my hubby was eating them I decided to share. I don’t want to call these pancakes because they are not “cakey” at all. To me when I hear banana pancakes I picture pancakes with bananas in them. So I am calling them Smashed Banana Eggs, because that is exactly what they are. Smash the banana in a bowl. Smash it so much that it is soupy. Then add the eggs. Mix it all up like a scramble, including the tiniest sprinkle of salt. Heat the butter or oil in the pan. 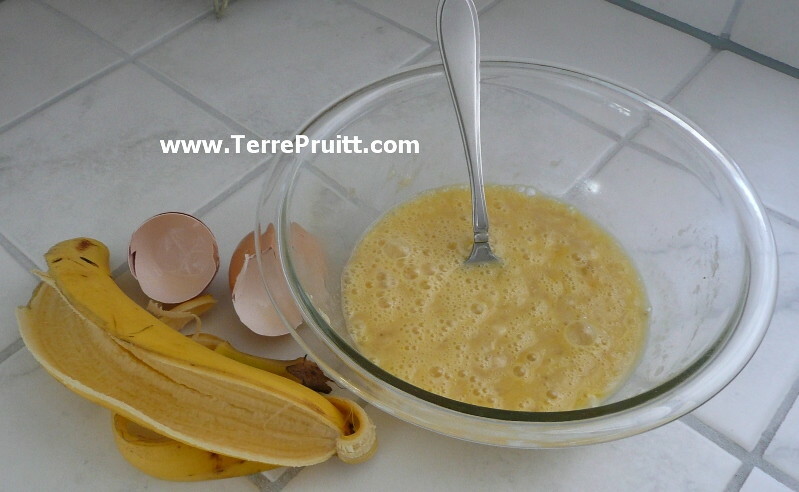 When it is hot pour the smashed banana and eggs into the pan forming small circles. Wait until the circle can be moved around the pan. When you are able to slide it then you can flip it. * Flip and cook on that side. When you think it is ready. Serve it with your choice of topping. *So for me, I just let them cook until they looked like they would survive being flipped and guess what? That didn’t always do it. Some of them broke apart. But that is ok. I like mine browned. I cooked them for a long time. I kept flipping them back and forth. As I have mentioned many times before the great thing about a recipe and cooking is you get to decide how to do it. 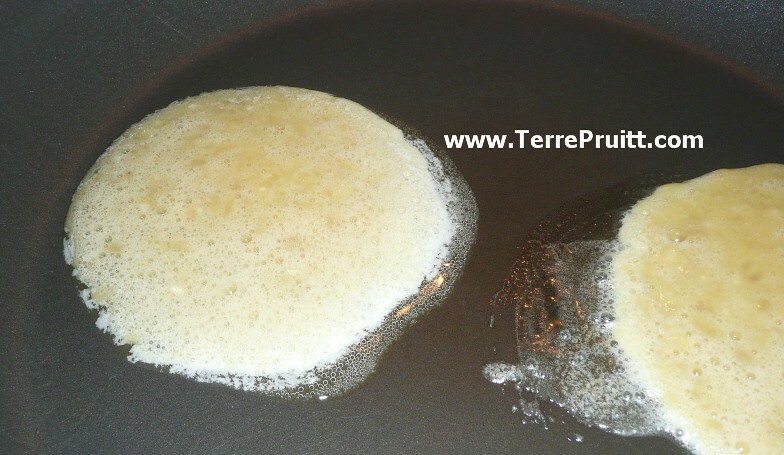 A recipe is a guide but you know how you like your eggs and/or pancakes cooked so you decide how long to do it. With me, since some of the circle didn’t survive the flip intact, I had little pieces that which I could taste so while I was cooking I was able to decide how cooked I wanted them. As with all of my experiments with food I am a little nervous getting my husband to try it. So I asked if he wanted to try something new. He said ok but asked what it was. At the time I didn’t have my new name figured out so I just said it was kind of like a pancake but not really. So then he asked WHAT was in it and I said eggs and bananas that is all. He was eating his while mine were still cooking. And he was saying that he had them before. He said his aunt in Hawaii made them for him. Sounds right to me. He really liked them. I think he likes them because they are tasty, but I also think that they are something from his childhood so that makes them even yummier. I just served them to him with butter. But I was trying to figure out another way, so on one of mine I sprinkled some cinnamon. That was really good too. As I mentioned in the “recipe” serve them with whatever you want. I am going to say that they are a bit rubbery, but that could be because I cooked them so long. I don’t mind rubbery, I just mention it because I want you to understand these are not pancakes. They are not bready. They are eggs with smashed bananas in them. I will be making them again. They were really good. Just so you know, the recipe above ended up making about 4 thin 5 inch “circles”. Thanks to Jason for posting the idea on his Facebook page. My hubby is happy to have a taste from his childhood. So what will you top your Smashed Banana Eggs with? 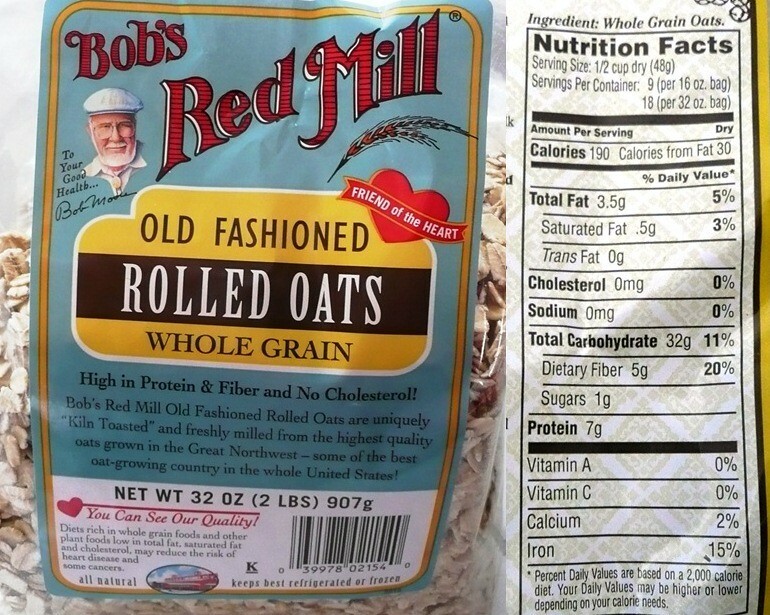 The fiber contained in oats is known in studies to have a cholesterol lowering effect. Since high cholesterol is associated with buildup of plaque in the blood vessel walls the lowering of cholesterol helps with heart disease. In addition to oats special fiber that helps lower cholesterol scientists have also found an antioxidant compound in oats that help lower the risk of cardiovascular disease. Studies have also shown that postmenopausal women can greatly benefit from eating oats at least six times a week. The study showed that the antioxidant slowed the progression of narrowing the arteries. In addition oats have been shown to improve or enhance the body’s immune system’s response to infection. They were mentioned in my post Some Foods Can Boost Your Immune System. Oats also help stabilize blood sugar. You have probably heard a lot of talk about flora in the intestinal track and how important it is to keep the guts healthy. Oats also contain phytochemical the gets converted to friendly flora and a healthy gut contributes to a healthy digestive system which helps the body in so many ways. If your digestive system is healthy it allows you to absorb the nutrients you need and eliminates the stuff you don’t need. Oats are also gluten-free which is very helpful since it is a whole-grain and it can be used as a serial and it can also be used ground as a flour. 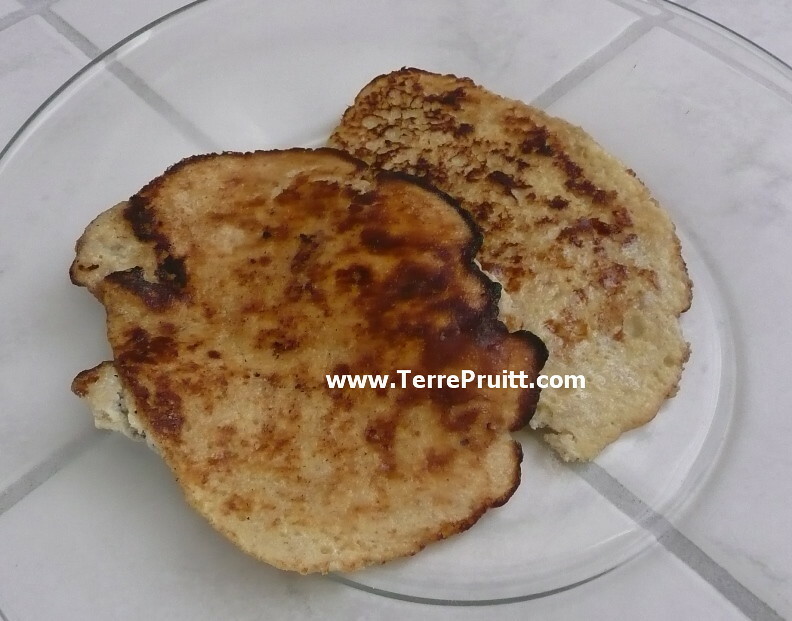 So it can be a very healthy substitute for gluten containing cereals and flours. Of the Daily Values there is 2% calcuim and 15% iron. A lot of fiber and a lot of protein and the benefits of a whole grain. I am thinking that I might even just like the oats toasted and eaten as a cereal without adding all the extra stuff as called for in the granola recipe. Since I have this whole bag I might just try that. Of course I will also have to use some of this bag for the Banana Oatmeal Walnut Cookies. Oats do contain tryptophan so if you get sleepy after eating them it could be more than just because you might think of oatmeal as a comfort food. With the large amount of fiber and protein this is a great food to start the day with, both fiber and protein help keep you full. So you can start the day off energized and satisfied. Oats are an incredible whole grain! Are you including this whole grain as part of your breakfast? I always want to share with you, what is going on in relation to Nia, but I know that there are other things to share about besides my upcoming new evening Nia class in Campbell (Oh, please forgive me, I am soooooo excited, I just HAD to put it out there. And, be warned, I will do it again!). I was walking by my newly purchased container of yeast when I remembered hearing about Nutritional Yeast. I know I have actually heard about it before, but I dismissed it as regular old yeast but with a fancy name. Let me remind you I have been afraid of yeast. Silly, I know, but . . . Anyway . . . when I was growing up my father was really into all the health food stuff. Stuff that you could not find in any store, but a health food store. All the stuff people are now eating, most people thought was weird back then. Not only was it weird, but it was hard to find. There was not a health food store on every corner and in every mall. But because of my dad, I would bet I heard about it way back then. I just saw it in a recipe recently so I looked it up. It is not regular yeast. In fact, it has been deactivated. See activating and deactivating fungus, come on, can you kinda see why it was a bit scary to me? So Nutritional Yeast has been deactivated. It is FULL of B vitamins. B-1, B-2, B-3, B-6, and B-12. Although one does not normally just EAT two tablespoons of Nutritional Yeast. It is added to things. And again, from what I am seeing you can add it to pretty much anything! Sprinkle it on all your foods from salad to popcorn. Put it in a smoothie or added it to a meat marinade. Informational reports say that it does have a flavor. What I am seeing is that it has a strong nutty type of flavor. Some say a cheesy flavor. So often it will be used to add the flavor of cheese to things. Whenever I see that I want to go get some. Then I get to the store and forget. I even was at the store and bought the aforementioned regular yeast but forgot all about this stuff. Nutritional yeast is sugar-free and gluten-free. So it is a great way to get a little bit of flavor and extra nutrition. Do you use it? I know a lot of you are much more kitchen/cooky/foodie savvy than me, so you have probably heard about it and even know what it is. Have you used it? Have you tasted it? How would YOU describe its taste? Tell me, I wanna know! I heard about quinoa awhile ago, but I never actually went ahead and bought some to prepare. I had never had it. 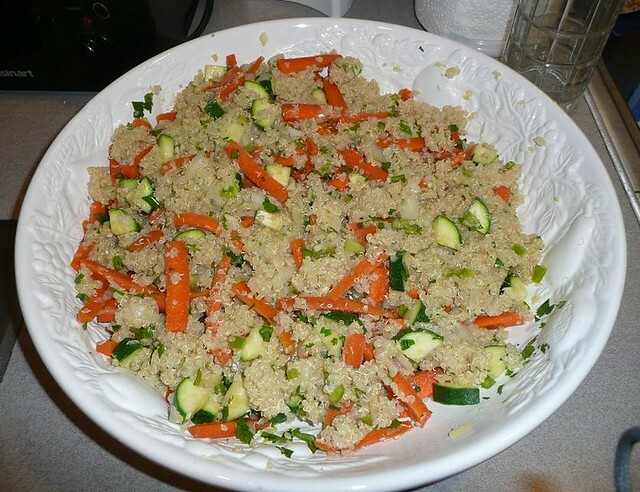 Today I went to lunch at a friend’s house where she made a beautiful and yummy quinoa salad. I had heard that this grain-like food was GREAT because it had so much protein. I’ve heard some people use it in place of rice, pasta, or couscous and I was thinking of doing the same thing. The way my friend prepared it was awesome. She cooked it, sautéed some vegetables, made a dressing with cilantro, and tossed it all together. We also added thinly sliced almonds and dried cranberries. We ate it warm, but it can be served hot, room temperature, cold . . . . however you like it. It was very good. I am happy to have finally tried quinoa. I don’t understand how they categorize things, but quinoa is more closely related to greens such as spinach than it is to a grain. We tend to treat it like a grain in the way we cook it and think of it nutritiously, but its scientific classification is, as I said related to spinach and we eat the seed. According to WHFoods, quinoa is a great source of magnesium which helps loosen the blood vessels so it is a good food for migraine suffers to add to their diet. Even it is actually a seed, as I said they compare it to a grain when it comes to nutrition so it is thought to have all of the health benefits of a whole grain. Quinoa is gluten free. A cup of quinoa has 222 calories, 4 grams of fat, 0 cholesterol, 13 mgs of Sodium, 39 grams of carbohydrates, 5 grams of dietary fiber, and 8 grams of protein. Since it has all nine essential amino acids it is a complete protein. Even though quinoa has almost twice as much protein and a lot more fiber than white rice, and more than brown rice and couscous, it has much more fat. A significant amount more. Here’s some numbers for comparison. I believe it can be a nice substitute for a rice or couscous every once in a while, but I would not consider it as a replacement. I would like to try it as a breakfast treat with honey and maybe nuts. I think that would be a good way to start the day. Good protein, fiber, and whole grains. Quinoa sounds very versatile. I’ll have to remember to thank my friend again for introducing me to yet another great food. What about you? Do you eat quinoa? How do you prepare it? How do you eat it?